Syndication.exoclick.com is a legitimate advertising service that helps site developers to receive ad revenue to finance their websites. Unfortunately, just like many similar platforms, this site is often abused by adware developers. Therefore, if your Google Chrome, Internet Explorer, Mozilla Firefox, Safari, Opera or another browser is continuously redirecting you to Syndication.exoclick.com site, it is highly likely that ad-supported software got into your computer without permission. As soon as the potentially unwanted program is established, it changes the web browser settings and actively tries to direct users to sponsored sites and display excessive commercial content in the form of pop-ups, in-text links, banners, deals, offers, etc. While adware is generally not considered to be malware, some clicks on generated content might lead users to phishing, tech support scam, or even malware-laden websites. Therefore, it is best to remove Syndication.exoclick.com redirects by terminating PUP before major damage to personal online safety and computer security is done. Symptoms Frequent redirects to Syndication.exoclick.com and other sites, pop-up ads, advertisement banners, etc. 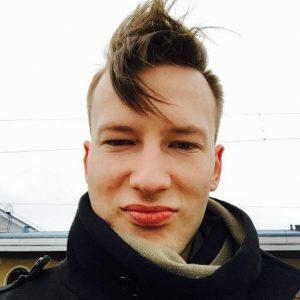 Syndication.exoclick.com is not the only legitimate service that is being abused by cybercrooks – Adclick, Traffic Junky, Cobalten.com – all suffered from the same activities. The presence of pop-up ads and other commercial content might generate money for the developers but it does nothing for the end user but annoy him or her, preventing from finding relative information and disturbing web browsing in general. Therefore, those who often see their browsers leading to questionable websites should take care of the termination of unwanted activity. However, the site can be associated with a variety of adware programs which might be difficult to relate it to. For that reason, we suggest you employ anti-virus software if struggle with Syndication.exoclick.com removal. Otherwise, you can also use our guide provided below. Aggregate a variety of information related to users' web browsing, etc. The latter should be especially concerning to users, as not only Anonymous but also Personal information might be tacked, and later used for advertising campaigns. Furthermore, the data might get leaked and misused by cybercriminals. Thus, the appearance of Syndication.exoclick.com redirects might be not as harmless as one might think. Once you terminate Syndication.exoclick.com infection, we suggest you also scan your device with Reimage to make sure all the malicious components are removed, and system settings are set back to normal. Adware and similar PUPs are not considered to be malware, although some of such programs might be extremely intrusive and pose a high risk to infected users (for example Advanced Mac Cleaner, participated in an OSX/Shlayer trojan campaign). Therefore, while mostly harmless, some PUPs might heavily modify system settings and compromise computer security. Thus, none of the computer infections should be treated lightly, and it is best to avoid them in general. Unfortunately, users are quite careless when it comes to online safety, and they often visit high-risk sites, download pirated software, carelessly install shareware or freeware. To avoid adware and other threats, you should be vigilant when browsing the internet and installing new software. It is best to stick to sites you are familiar with when it comes to software downloads, even though even the most popular sites are bundling programs. So the only ways to protect yourself is by learning how to establish new applications correctly. Do not rush the installation process and always carefully read through the installation instruction. It is also critical to make sure you select Advanced or Custom settings to be able to remove all the optional elements that would otherwise be installed. One thing to take note of: if you enter the list of the installed programs on your system, you will not find a “Syndication.exoclick.com virus” entry. The redirects to the site are directly related to the adware application that was installed by you (most likely). There are several rogue apps that pretend to be legitimate, but often only cause the disturbance, bringing no positive results to the user. You can look for such software like system optimizers, driver updaters, PDF converters, etc. 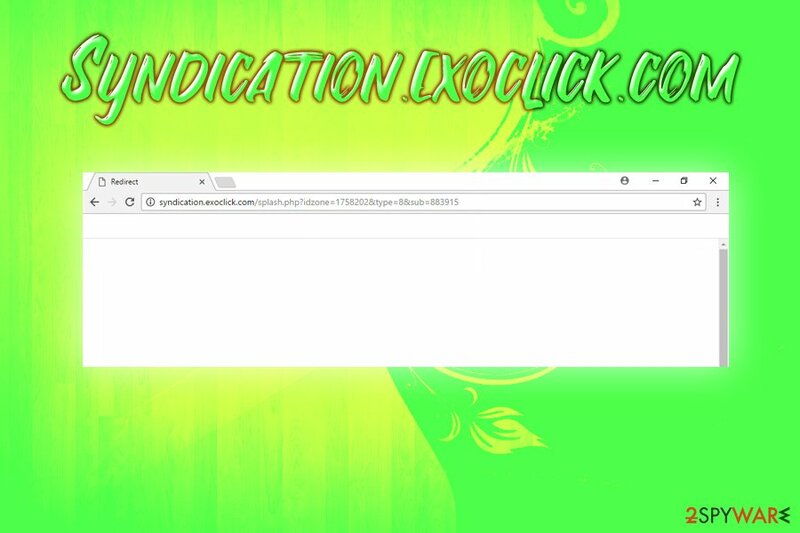 Syndication.exoclick.com removal can be performed once you detect such unwanted programs and terminate them, Be aware that you might not even know some of such apps were installed on your device. However, if you are less computer savvy user, we suggest you simply download and install anti-virus software that specializes in potentially unwanted programs – it will do everything automatically. Once you remove Syndication.exoclick.com adware from your system, reset each of the installed browsers to make sure no traces of the infection remain. Here, look for Syndication.exoclick.com or any other recently installed suspicious programs. Wait until you see Applications folder and look for Syndication.exoclick.com or any other suspicious programs on it. Now right click on every of such entries and select Move to Trash. When in the new window, check Delete personal settings and select Reset again to complete Syndication.exoclick.com removal. Once these steps are finished, Syndication.exoclick.com should be removed from your Microsoft Edge browser. Here, select Syndication.exoclick.com and other questionable plugins. Click Remove to delete these entries. Now you will see Reset Firefox to its default state message with Reset Firefox button. Click this button for several times and complete Syndication.exoclick.com removal. Here, select Syndication.exoclick.com and other malicious plugins and select trash icon to delete these entries. Click Reset to confirm this action and complete Syndication.exoclick.com removal. Here, select Extensions and look for Syndication.exoclick.com or other suspicious entries. Click on the Uninstall button to get rid each of them. Now you will see a detailed dialog window filled with reset options. All of those options are usually checked, but you can specify which of them you want to reset. Click the Reset button to complete Syndication.exoclick.com removal process. ^ Tech support scams. Microsoft. Windows IT Pro Center. ^ Alexandra Ossola. How adware invades your computer and steals your personal data. The Week. Weekly news magazine. ^ How can adware be dangerous to your computer?. Quora. Question-answer site. This entry was posted on 2019-03-28 at 06:44 and is filed under Adware, Viruses. You can quickly scan the QR code with your mobile device and have Syndication.exoclick.com manual removal instructions right in your pocket. How did you remove Syndication.exoclick.com?